willie's bike has to go....any takers? Stop by the shop for details. Or, check out the listing on Craigslist here. Call (615) 292-5005 with any questions. God, family and friends (old + new) make imogene+willie. a little sappy this morning, but just needed to say how appreciative we are of all of you for helping us with this project. here at imogene + willie we are big fans of cuffed denim. 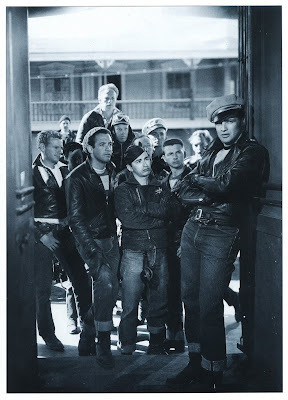 for those of you who need a little inspiration, consider netflixing 1953's The Wild One with Marlon Brando. you may have to watch it on silent (not much in the way of plot) but MAN, those cuffs look good! "Do you just ride around or do you go on some type of a picnic or something." "A picnic? Man, you are too square. I have to straighten you out. Now listen, you don't go any one special place; that's corn-ball style. You just go (he snaps). A bunch gets together after all week; it builds up. You just...the idea is to have a ball. Now, if you goin' to stay cool, you got to wail. You got to put something down (he snaps). You got to make some jive. Don't you know what I'm talking about?